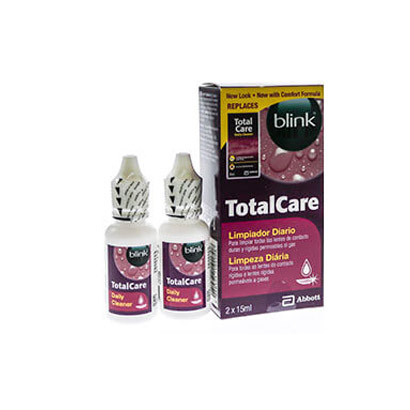 For users of gas permeable and hard contact lenses, you can now use Total Care Daily Cleaner Twin Pack, from renowned manufacturer AMO, for cleaning and disinfecting. Total Care Daily Cleaner Twin Pack can be used as part of the Total Care System, along with Total Care Disinfecting Storing and Wetting. This rigid gas permeable contact lens solution works to remove any build-up of deposits, debris and protein from the lens surface. This means you can rely on uninterrupted and clear vision, whilst enjoying a healthier lens wearing experience. The solution cleans off any dirt so that your contact lenses can be stored overnight. By keeping up with this daily cleaning routine, levels of comfort are improved and the length of time that contact lenses can be worn is maximised. At FeelGoodContacts.ie, we stock a wide range of products in order to cater to the preferences of our customers. Please contact our customer service team who are standing by to answer any questions or queries you may have. Excellent cleaner. Rapid delivery. Great. I have been wearing gas permeable contacts for over thirty years. The Total Care product range has always been reliable for keeping lenses clean and comfortable throughout the day. Excellent service,competitive price,will use again. Great product, but the new 15ml bottles are unnecessary. I preferred the 30ml ones.